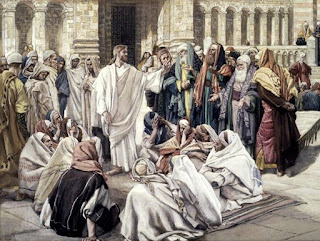 The truth behind what Jesus meant when he said to the Pharisees: “If ye believe not that I am he, ye shall die in your sins” (John 8:24) is contained in the Old Testament Scriptures. In fact, Jesus was literally referring to a certain passage when he spoke those words! Realize, the Old Testament (written on scrolls) was ALL the people of Jesus’ day had to read and understand about God and His plans; and the Pharisees would read from them every Sabbath day in the synagogues. In those ancient Scriptures God had made many prophecies about a coming Messiah, some of which the people of Jesus’ day understood and many of which they flat-out didn’t. So the confusion and mystery concerning this Messiah (or this “Christ”) — namely, who he would be and what he would say and do — can be evidenced in the dialogue of the people of Jesus’ day as recorded in the four New Testament Gospels. One of the prophecies in the Old Testament Scriptures concerning this Messiah was EASY to understand. The Pharisees knew it well, and so did the common synagogue-going Jew. The prophecy was about a special & unique “Prophet” who was to come; and God Himself had spoken words about this Prophet, which Moses then wrote down in the book of Deuteronomy. The anticipation of the arrival of this Prophet is palpable in the people of Jesus’ day! They came to John the Baptist and asked: “Art thou THAT Prophet?” (John 1:21). He wasn’t. Later, after seeing Jesus perform a miracle, some said: “This is of a truth THAT Prophet that should come into the world” (John 6:14). And again, after hearing Jesus speak, some said: “Of a truth this is THE Prophet” (John 7:40). Do you see? The Pharisees and Jews were anxiously looking for this Prophet’s arrival! Oh, but what had God spoken about this Prophet in the ancient Scriptures? Listen to it: “I will raise them up a Prophet from among their brethren, like unto thee (Moses), and I will put MY WORDS in his mouth; and he shall SPEAK unto them ALL that I shall command him. And it shall come to pass, that WHOSOEVER WILL NOT HEARKEN UNTO (OBEY) my words which he shall speak in my name, I will require it of him” (Deuteronomy 18:18-19). Listen to it in the Living Bible: “I will raise up from among them a Prophet, an Israeli like you. I will tell him what to SAY, and he shall be MY SPOKESMAN to the people. I will personally deal with anyone who will NOT LISTEN to him and HEED (OBEY) his messages from me” (Deuteronomy 18:18-19, Living Bible). Wow, do you see? God’s “deal” with this Prophet was that when he came along ... the people MUST LISTEN to his WORDS (TEACHINGS) and OBEY them! And the Pharisees and Jews clearly understood this!!! Now, listen again to Christ’s words to the Pharisees in John’s Gospel: “If ye believe not that I am he, ye shall die in your sins” (John 8:24). Do you understand now? Jesus was saying (and I am paraphrasing): “If you don’t believe that I am THE Prophet who is to come into the world — with God’s Words (or message) in my mouth! — that you must heed, then you will die in your sins, because you won’t repent and obey me!” Friend, hear me; the Pharisees KNEW this is what Jesus meant when he spoke those words to them! And OHHHH how they HATED His Words! They HATED His teachings! And yet, all he taught was love! He taught 'obedience to the 10 Love Commandments' was the path to eternal life. But the prideful Pharisees willfully and continually disobeyed them! Therefore, Jesus said to them, “You will die in your sins, if you don’t believe I am he (the one you should obey)!” And so will you and I, if we do not obey THE Christ: “And being made perfect, he (Jesus) became the author of eternal salvation unto all them that OBEY him” (Hebrews 5:9). Yes, Jesus' words to the Pharisees in John's Gospel are in perfect agreement to the answer he gave to that all important question of “Teacher, what must I DO to obtain eternal life?” … to which he answered, “KEEP the (10 Love) Commandments!” (Matthew 19:17). Read "Art Thou THAT Prophet? (part 1)" HERE. Approximately 867 Weeks (Sabbaths) Remaining Till Christ's Return! Only those who FULLY understand what God was doing and speaking through the Old Testament Bible stories can truly appreciate what God did in the Tim Tebow football game twelve days ago. In the ancient Bible stories, God would control every detail of real people’s lives (circumstances, happenings, numbers, etc.) in order that those events secretly foretold “things” about the Messiah — namely, WHAT he would do, and WHEN he would do it! These things are FASCINATING to learn and understand, and I have written about them in my book. For instance, the story of Noah is one massive prophetic story about Jesus Christ’s Second Coming to Earth. It foretells one righteous house of people will lift up off of Earth’s surface into the air (rapture) to be safe with the Lord — like Noah’s family in the Ark — while all the wicked people and Earth’s surface are destroyed by a Flood of fire—like the global Flood of water did in Noah’s story. And God planned for Noah to be 600 years old when the Flood occurred to foretell Christ’s Second Coming will occur when Earth is 6,000 years old. Do you see? God was controlling every detail of the story, so that the events of the story make the prophecy!!! Fascinating! Incredible! God is AMAZING! Well, stunningly, the January 8, 2012 Tim Tebow football game is COVERED with these same prophetic fingerprints of this incredible God! In other words, it’s His M.O. out and out!!! Truly, the story (details) of the game could be included in the Bible, for its message is perfectly harmonious with God’s other prophetic Bible stories concerning His son’s return. THIS is what I want you to see! Look, the overtime “passing play” that ENDED and WON the game — which was a prophetic picture of the day Christ returns, when he will put an end to Earth’s 6,000 year ‘age of sin’ and win the game for him and the saints, destroying the Antichrist & all the wicked! — could NOT have occurred in the final seconds of the 60 minute game, for then it would have been incorrectly prophesying that Christ will return BEFORE the end of Earth’s 6,000 year. Do you see that? So God HAD to control the circumstances of the game so that the score was tied at the END of 60 minutes, in order for Him to THEN control one play “immediately after” the 60 minute game was over to win it, just like Jesus and the saints will win on the day of his return, while Satan and all the wicked will lose “immediately after” 6,000 years are over on Earth! But I want to reveal one more thing God spoke by carefully controlling the details of the football game’s winning “passing play”. During the play, you will notice the receiver who caught the pass performs an incredibly effective “stiff-arm” to the opposing team’s defensive player, which then FREES him to finish (running) the play and win the game. Amazingly, this “stiff-arm” foretells the “stiff-arm” Satan will receive from God’s angel on the Day of Christ’s return, for he will “strong-arm” him and cast him into the bottomless pit for a thousand years — which officially FREES the saints! — for Satan and his demons will no longer be able to tempt them to sin during Christ’s glorious Earthly 1,000 year Sabbath reign. Listen to John the Revelator: “And I saw an angel come down from heaven, having the key of the bottomless pit and a great chain in his hand. And he LAID HOLD on the dragon, that old serpent, which is the Devil, and Satan, and bound him a thousand years, and cast him into the bottomless pit, and shut him up, and set a seal upon him, that he should deceive the nations no more, till the thousand years should be fulfilled” (The Revelation 20:1-3). See, this is going to be taking place as the saints are “caught up” in the air to meet the Lord during the day of his return! Truly, what God did and spoke through the Tebow football game is nothing short of INCREDIBLE! Now listen, we are NOT living in the “time” of this winning passing play, for God has clearly prophesied in His Word AND through this game that IT will NOT occur until Earth’s 6,000 year arrives. But, I believe, God DID want to attach a prophetic number to the play JUST for the purpose of giving one more clue to WHEN it will occur. That number was “80”. Or the 80 yard passing play! This, I believe, was God confirming (as in Psalms 90:10) that 80 years is the numerical age of the generation of people that “shall not pass, till ALL these things be fulfilled” since the Fig Tree (Israel) “putteth forth leaves” (became a nation again) in AD 1948. If this is correct, and the Feast of Trumpets AD 2028 (AD 1948 + 80) is the “time” of the passing play (Christ’s return); then there is precisely 16.75 years left — or 10.05 seconds left on the clock till the end of a 60 minute football game! — till Earth’s 6,000 year arrives at the writing of this blog. Which team will you be on when the final play comes? Watch “stiff-arm” in slow motion at 2:28 of this VIDEO. Watch prophetic truth of Noah’s story HERE. Read miracle behind making of Noah video HERE. Read "Tim Tebow & God's Prophetic Voice: 316, 31.6, 3:16 and more (part 1)" HERE. The picture I saw was of a balloon man going to get the helium to fill the thousands of balloons which would lift the house off the earth ... Only now as I write this tears are forming because I just realized my great grandfather was a balloon salesman, so the man in my dream surely represents God our 'Great, GrandFather ...' Then I heard the words, "I am preparing Gabriel ..."
When I woke up I immediately thought of the ark symbolism from your book and meant to email you right away but then got distracted with my busy morning schedule, so God just reminded me by sending me an email from a company called "Ark". Lol. Isn't He amazing!! I hope that serves as some encouragement to you as I'm sure there are plenty of naysayers and critics out there ... Don't let them get you down ... because in God's eyes you seem very clearly to be way high "Up!" (...Up and Away! :) ... with two thumbs "Up" from the only 'critic' that matters in the universe who has the final answer on "Time's 'Up'"! p.s.s. I’ve said this before, but I’ll say it again … this is NOT about me, folks! This is about YOU!!! God is doing these miracles so YOU will have further reason and evidence to believe the message He has spoken through me! To put it bluntly ... He wants YOU to read the book I wrote. Enough said. Approximately 868 Weeks (Sabbaths) Remaining Till Christ's Return! I was led by the Holy Spirit to analogize in my book (really God’s book, not mine!) that God’s Creation is like a football game. Here’s what is written on pg 50: “You might ask; how does God receive pleasure from the things He created? The answer is because He set up creation like a game!!! … It is like mankind “creating” the game of football for his pleasure. The game has a playing field, a beginning an ending time, rules, and players that can win or lose .... Let us now examine the components making up the Game of Life God has created for His pleasure: The playing field is planet Earth, the length of the Game is 7,000 Earth trips around the sun, the rules are the 10 Commandments, the players are His spirit children, and the Bible is the Game’s handbook.” I bring the aforementioned book passage up in today’s blog just for you to take note that God had me liken His Creation to a football game in AD 2008. Well, this past weekend on Sunday January 8, 2012, God AMAZINGLY used a football game to speak to mankind! A Christian rookie quarterback named Tim Tebow—whom the pundits and critics have lampooned all season for his faith and play—led an 8-8 Denver Broncos team to an improbable victory over a 12-4 Pittsburgh Steelers team in a first-round playoff game. No one gave him any hope of winning, but he did! But here’s the kicker; in college Tebow would paint Scripture references on his eye black—this is not allowed in pro-football—and he wore John 3:16 during the AD 2009 Collegiate Championship game. So what did God miraculously do this past Sunday night? He guided Tim Tebow to throw for a total of 316 yards passing with an average of 31.6 yards per catch!!! The pundits noticed the 316 / 31.6 / John 3:16 “coincidence” and wrote about it; then millions of people across America Googled the Bible passage—making it the #1 search on Google for a day!—after the game, reading: “For God so loved the world, that he gave his only begotten son, that whosoever believeth in him should not perish, but have everlasting life” (John 3:16). Hallelujah. God knows how to deliver His Word to the world, folks! Oh, but this is not all God spoke through the game! For on pgs 75-76 of my book I wrote: “Friend, the stakes in the Game of Life are extremely high: Your priceless soul’s ETERNAL destiny is on the line! And the Game is almost over!!! Year 6,000 is fast approaching with the return of Jesus Christ to planet Earth and the setting up of his 1,000 year Earthly Sabbath reign. If the first 6,000 years of mankind’s history were equated to a 60 minute FOOTBALL GAME, approximately 12 seconds would be left on the clock till Christ’s return at the writing of this book in AD 2008. That is how late is!” So in the Tebow game this past weekend, God miraculously controlled the circumstances in order for the game to be tied at the END of 60 minutes. And this took the game to overtime: Here’s where God’s astounding prophetic voice spoke! A coin toss decided who got the ball first ... Tebow got it. (Think that was a “lucky” coin toss? ... Think again!) Then, on his VERY FIRST PLAY (in other words, IMMEDIATELY AFTER the 60 minute game was over!) he threw an 80 yard passing play for a touchdown, which WON the game instantly!!! Jesus said, “IMMEDIATELY AFTER the tribulation of those (Antichrist's) days … they shall see the Son of man coming in the clouds of heaven with power and great glory. And he shall send his angels with a great sound of a trumpet, and they shall gather together (rapture) his elect (saints) from the four winds, from one end of heaven to the other” (Matthew 24:29-30). Listen, the Antichrist will be given the last 3 ½ years to “wear out the saints” (Daniel 7:25) during a time of Great Tribulation leading up to Earth’s 6,000 year. Then, IMMEDIATELY AFTER the Great Tribulation (or immediately after the END of 6,000 years!) there’s going to be a SINGLE PLAY ... Oh, and yes, it's going to be a “passing play” that’s going to WIN the game for Jesus Christ and all the elect!!! For the saints will PASS from death unto life, receiving their glorified bodies as they PASS (ascend) into the air to meet Jesus Christ in the clouds! Hallelujah. Exactly like God prophesied through the Tebow game!!! Oh, but God’s prophetic voice didn’t stop there! For after Jesus said the above words in Matthew’s gospel, he said: “Now learn a parable of the fig tree; When his branch is yet tender, and putteth forth leaves, ye know that summer is nigh: So likewise ye, when ye shall see all these things, know that it is near, even at the doors. Verily I say unto you, This GENERATION shall not PASS, till ALL these things be fulfilled” (Matthew 24: 32-34). In scripture, the nation of Israel is known as the Fig Tree: “I found Israel like grapes in the wilderness; I saw your fathers as the firstripe in the fig tree at her first time” (Hosea 9:10). Against all odds, Israel “put forth her leaves” (became a nation again) in the year AD 1948, and thus began the final generation! And God said through Moses: “The days of our years are threescore years and ten (70); and if by reason of strength they be fourscore (80) years, yet is their strength labour and sorrow; for it is soon cut off, and we FLY AWAY (rapture)” (Psalms 90:10). And how long was Tebow’s winning pass play? Exactly 80 YARDS !!! Did God just confirm the year AD 2028 (1948 + 80) will be the year of His son’s return to Earth? I’ll leave you to ponder that! Read article about Tebow's humility HERE. Read article about 316, 31.6, & 3:16 HERE. Watch game winning 80 yard touchdown HERE. TRUE meaning of John 3:16 HERE. 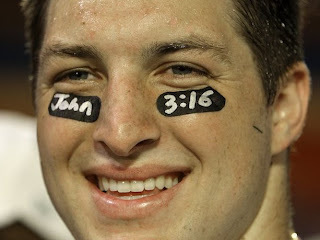 Read "Tim Tebow & God's Prophetic Voice: 316, 31.6, 3:16 and more (part 2) HERE. Approximately 869 Weeks (Sabbaths) Remaining Till Christ's Return! There’s an exchange of words Jesus had with some Pharisees one day (recorded in John’s gospel) that Satan wisely uses to help defend a dangerous and erroneous doctrine he's concocted in today’s church world concerning what YOU MUST DO to obtain eternal life. I’m telling you friends, Satan is a MASTER deceiver! He loves to twist God’s Word around to mean something other than what it does, all for the purpose of making you believe something that will have you living a lifestyle that will end with your soul with him in the lake of fire one day! THIS is Satan’s REAL PURPOSE behind EVERY LIE he tells, folks!!! He’s out to KILL YOU! He’s out to DESTROY YOU! He cannot stand the fact that he has no chance of being reconciled with God, but you still do. So he’s out to make sure your one chance comes and goes without you being reconciled either! Sick, isn’t it? Yet, that’s Satan’s entire existence right now in a nutshell. But please, please, always remember … on the issue of “what MUST YOU DO to obtain eternal life”, Jesus was asked this VERY QUESTION several times by people, recorded in the Scriptures, and his answer was “IF thou wilt enter into life, keep the (10 Love) commandments” (Matthew 19:17). See, these words are self explanatory: IF you want to obtain eternal life, YOU MUST LOVE! Never forget these words. If you hear doctrine in a church that is trying to diminish these words, or make them out to be a lie … RUN FROM THAT BUILDING LIKE A WILD MAN!!!!!!!! With this Truth being understood, let’s take a look now at Christ’s altercation with the Pharisees in John’s gospel. After doubting he was the Messiah and accusing him of pride, Jesus turned to the Pharisees and said: “If ye believe not that I am he, ye shall die in your sins” (John 8:24). Oh, my! Ding. Ding. Ding. Play time for Satan! Get rid of the time period, setting, context, and isolate those words, and here's what you get … Satan’s lying voice cackling through minister’s mouths today, “ALL you need to DO to ensure you will obtain eternal life is mentally acknowledge Jesus is the Messiah. That’s it! See, if those Pharisees would have mentally acknowledged Jesus was the Christ, they would not have died in their sins.” Wow, are you kidding me? Insanity! Friend, if you want to believe that lie, then please, please, don’t open your Bible and read ANYWHERE else. Trust me on that! Just keep your Bible closed! Obviously, this is NOT what Jesus meant by those words; for if that was ALL he meant by them, then he contradicted the answer he gave to “What MUST I DO to obtain eternal life?” that people asked of him. Do you see that? Either “keeping God’s (10 Love) Commandments” is what WE must DO to obtain eternal life, or just hearing about the Messiah and “mentally acknowledging he died for our sins” is what WE must DO. So which is it? Is Christ’s plain answer to that all-important question a lie, or is it today’s interpretation of Christ’s words to the Pharisees in John’s gospel that’s a lie? I think you know the answer. I’ll explain what Jesus REALLY meant by those words to the Pharisees (which they knew too!) in next week’s blog (or part 2) on this topic. Read "Art Thou THAT Prophet? (part 2)" HERE. Approximately 870 Weeks (Sabbaths) Remaining Till Christ's Return!